As a 13-year-old in a boarding school, I would sit in my dorm room with my friends flipping through old-battered copies of Vogue, talking about how one day we would all be featured in the magazine. Could we place "flipping" in the sentence without using conjunction in between the two sentences. If there is any particular reason please explain me properly. The best explanation I can give is that sometimes the rules of compound sentences are disregarded in creative writing to indicate that everything is happening at once and to recreate the feeling of a "stream of thoughts" rather than a carefully constructed sentence. 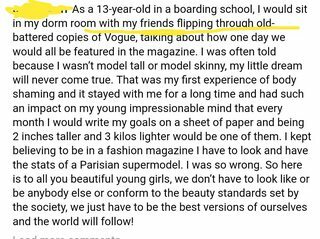 As a 13-year-old in a boarding school, I would sit in my dorm room with my friends flipping through old-battered copies of Vogue, and talking about how one day we would all be featured in the magazine. This reads like 3 separate activities that did not necessarily all take place at the same time; in other words when the writer was 13, sometimes he would sit in his room with his friends flipping through Vogue, and sometimes talking about featuring in the magazine. What the writer is trying to convey is that all of this would happen at the same time - they would talk while they were looking through the magazines. This is why there are no conjunctions breaking up the sentence. Likewise there is no comma before 'flipping' because again this would imply a list of consecutive activities and the predicate "flipping through old battered copies of Vogue" alone would not be grammatically correct as it lacks a subject. We sat in my dorm room while we flipped through pages while we talked. I want to finish my homework before going out to play. He went running down the street, shouting. They stood watching the disaster. Because it's serving in an adverbial role, no comma is required, and a conjunction would make the sentences grammatically incorrect. Not the answer you're looking for? Browse other questions tagged sentence-usage comparative-constructions or ask your own question. Is the following sentence still grammatical even though I omitted the verb?